An artist’s rendering of the office building under construction on Pier 4 where education publishing firm Cengage will move its headquarters. Another big-name company is moving to the Seaport. Educational publishing firm Cengage said Thursday that it has signed a 10-year lease for a new corporate headquarters at an office building under construction on Pier 4. Cengage, which makes print and digital textbooks for higher education, moved its corporate headquarters in 2014 from Stamford, Conn., to Boston, where it has an office at Channel Center in Fort Point. Now it’s joining a string of blue-chip companies — software company PTC, drug makers Vertex and Alexion, law firm Goodwin — moving their corporate offices into the new towers sprouting in the Seaport District. Cengage will share the building at 200 Pier Four with a new headquarters for Boston Consulting Group, which is moving there from two offices in downtown Boston. New York-based developer Tishman Speyer launched construction on the 13-story, 370,000-square-foot office building without any tenants signed, and now has commitments for nearly all the space, with an opening planned for May. At 117,000 square feet, Cengage’s five-story office is a bit smaller than its space in Channel Center, but chief technology officer George Moore said he expects it will be a good fit for the company. All 500 Cengage employees in Boston will make the move, and the company is looking to fill about 100 additional positions. 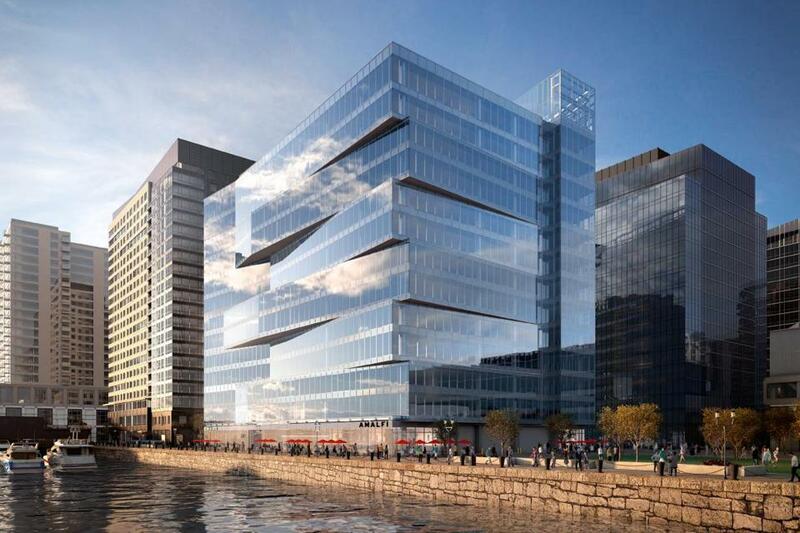 Several more office buildings are planned for nearby blocks, including WS Development’s cube-shaped mid-rise at 88 Seaport Blvd., and a collection of recently permitted office buildings along Boston Wharf Road toward Congress and Summer streets. WS says it’s in talks with prospective tenants about 88 Seaport. Meanwhile, developer Tishman Speyer is also finishing work on a luxury condo building further out on Pier Four.